Uuuurh, how do I turn 20 this month? I am not ready to adult. To help ease the thought of this, I decided to fix myself up a little bday wishlist. 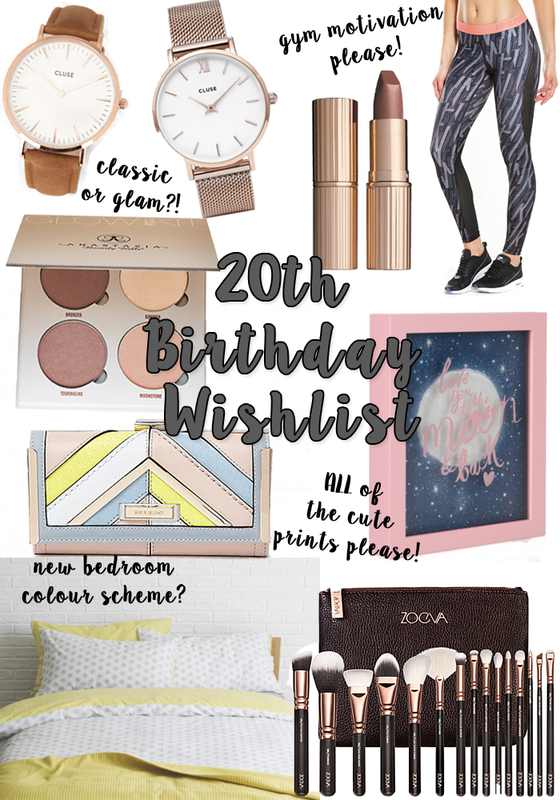 There’s not really any major presents I want this year, and getting together this wishlist actually proved quite challenging! I’ve been after a new watch for years now after being a bit bored of my chunky Marc Jacobs one, but I’m stuck between getting a classic brown leather strap, or the classy mesh style! In terms of beauty wants, I really want to get some new brushes – my old amazon jobbies are starting to fall apart on me and I loved the zoeva silk finish brush I bought a few months ago to try out! Of course some makeup has to fall in there too – CT Pillow Talk and the Anastasia Glow Kit are certainly items bloggers have made me need want! I live in gymwear at uni because of the amount of netball I play, and over summer I really want to keep up my fitness in the gym, what better way to motivate myself with some amazingly pretty leggins?! My purse is beginning to get a bit scraggly now and despite looking everywhere, River Island always seems to win on this front – the card to coin space ratio seems to be just right! Finally I’m really eager to do up my room at home soon – the furniture is all perfect but the decor just needs a bit of sprusing! I’m thinking of going for a yellow and grey theme, and dusty pink and grey when I want to switch it up – what do you think?! This Habitat duvet cover is so bright and pretty, I just love it! I also want to cover my room with cute quotes and sayings, if you follow me on instagram you’ll know how much I love a good quote. I saw this ‘Love you to the moon and back’ back in February and hinted at Jamie to pick me one up for Valentines. This time I’ve also pointed it out to my mum.. if all else fails, it’ll be a gift from me, to me!